The old adage “use it or lose it” definitely applies to muscle strength. This is especially true for seniors, who are vulnerable to a condition called sarcopenia. Sarcopenia is the age-related loss of lean muscle mass. This can occur due to a variety of factors, including hormonal changes that interfere with the body’s ability to build lean muscle, inadequate dietary protein, oxidative stress, inflammation, and of course lack of exercise. 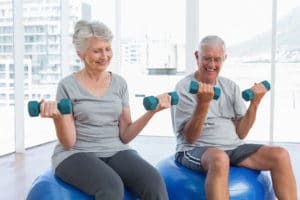 Sarcopenia is a serious health concern for seniors, because when muscle is lost, strength and mobility also suffer. This can compromise seniors’ independence as well as put them at risk for falls and injuries. Fortunately, you can fight sarcopenia with strength and resistance exercises to build and maintain your muscles. Before beginning any exercise program, be sure to consult with your doctor, especially if you have any existing health issues. Chair Squats: Stand in front of a sturdy chair with your feet slightly more than shoulder-width apart and your arms extended in front of you, parallel to the ground. With your weight on your heels, bend your knees and slowly lower your buttocks to barely touch the chair. Pause and then slowly stand back up, keeping your back straight and your knees over your ankles. Do not allow your knees to go forward past your toes as this will put stress on the knee joint. If you cannot sit all the way down at first, stack some pillows in the chair and do a shallower squat. Do 2 sets of 10 reps.
Wall Push-Ups: Stand a bit further than arm’s length from a bare wall. Lean forward and place your palms flat against the wall at shoulder height, about shoulder-width apart, as if you were doing a push-up. Bend your elbows to lower your upper body towards the wall. Pause and then slowly push yourself back until your arms are straight. Do not lock your elbows or round or arch your back. Do 2 sets of 10 reps.
Step-Ups: Stand at the bottom of a staircase with your feet flat and your toes facing forward. Hold the handrail for balance and place your left foot on the first step. Slowly straighten your left leg to lift yourself up, making sure your knee does not move forward past your ankle. Tap the step with your right foot and slowly lower back down. Do 2 sets of 10 reps on each leg. These exercises will provide a good foundation for building your upper and lower body strength. Once you have mastered them, you can move on to more strenuous strength exercises. Ask your doctor for advice and guidance.